He loved the song so much that he wanted to share it with his friends at summer camp, and I was happy to oblige! 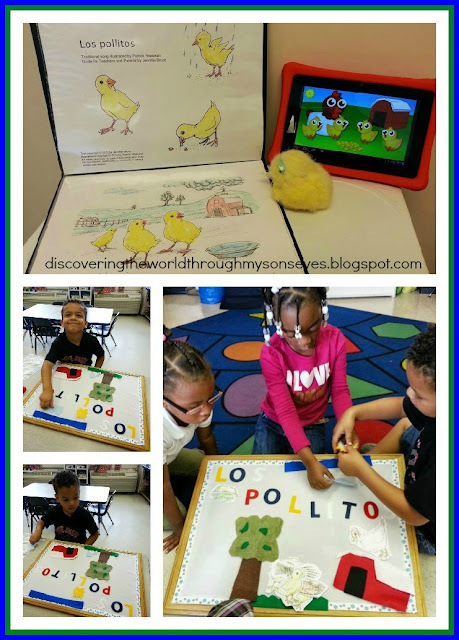 I was pretty excited when I found a guide for “Los Pollitos” from Spanish Playground. The guide includes: coloring pages, cut-out for stick puppets, etc., and I love it! In preparation for the Spanish language summer program little one and I practiced the song. I used the guide to tell the story, and he helped me cut-out the puppets. 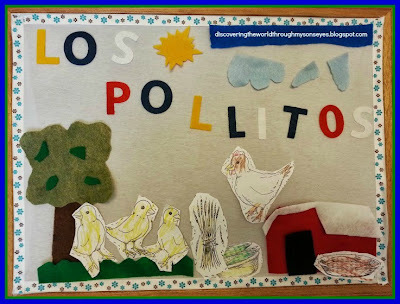 I pulled out the Spring felt board we created, and cut-out a felt barn. 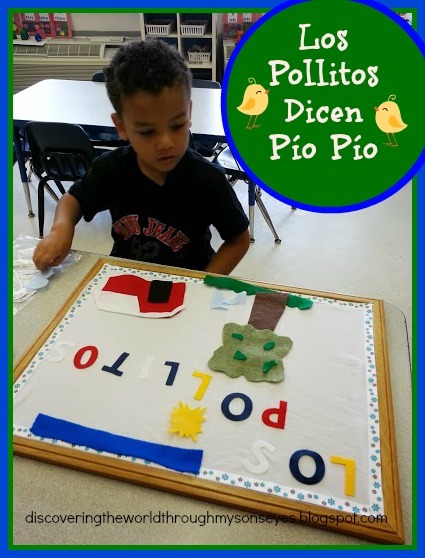 I was pretty excited when he started looking for the felt letters to spell out “los pollitos” because he would say the letters out loud in Spanish, and then as he was looking through he’d say, “Esta no es la letra. Aja te encontré”… I about died! Ha! He was talking to himself in Spanish! Before the Spanish session little man helped set-up the board. I noticed some songs have a slight variation towards the end, but if you’re interested in the lyrics click here. The children had a great time, and my son enjoyed taking the lead in singing the song. Until our next Spanish session! I learned this song from my husband. Love the activities you have to go along with it, and so sweet that he is talking to himself in Spanish now. He has come such a long way!